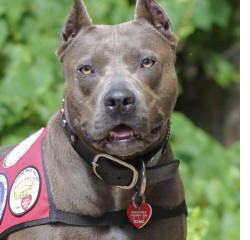 Elle is the American Humane Association's 2013 Hero Dog of the year. She is a Therapy Dog and has her AKC Canine Good Citizen certification. She is also an American Bull Terrier, often called a Pit Bull. Breeders say they are friendly, intelligent and make great family pets. Unfortunately there are those who misuse members of the breed for dogfighting because of their muscular build and strength. For many people, the idea of two dogs getting into a fight doesn’t seem all that far-fetched. But the vicious “sport” of dogfighting became big news in 2007 when football star Michael Vick was convicted as a co-conspirator in a dog fighting ring. The attention to the issue of dogfighting resulted in passage of a federal law making the activity a felony in all fifty states and the District of Columbia. This week a South Alabama man was arrested as part of a continuing federal investigation into dogfighting across four states, including Georgia, Mississippi and Texas. Thirteen others were already in custody, along with more than four hundred dogs seized in raids over the past couple of months. Following a three-year investigation enough evidence was gathered, a grand jury issued indictments and the United States Attorney’s office and the FBI moved in to arrest the individuals charged. Officials turned to the Humane Society of the United States and the ASPCA for help in removing and transporting the dogs to temporary emergency shelters in undisclosed locations. The animals had been living in deplorable conditions, some without adequate food or water. Many had scars and injuries consistent with dogfighting. All are finally receiving proper care and veterinary attention. In addition to the dogs, authorities also seized illegal drugs, firearms, and more than half a million dollars in cash. Make no mistake about it – dogfighting is not just a disagreement between two pets. It is a vicious high-stakes battle between animals that have been bred, trained, and abused to the point that they will fight one of their own kind, even to death, all for the entertainment and greed of humans. This coordinated operation - the arrests of individuals and seizures of dogs - is a great example of what can happen when law enforcement and animal welfare organizations work together to stop the abusive, barbaric and illegal bloodsport of dogfighting. According to the president of the ASPCA, “Never again will these dogs be forced to fight, live in squalor, or be neglected and deprived of the bare necessities.” I could not have said it better, when I’m speaking of pets.